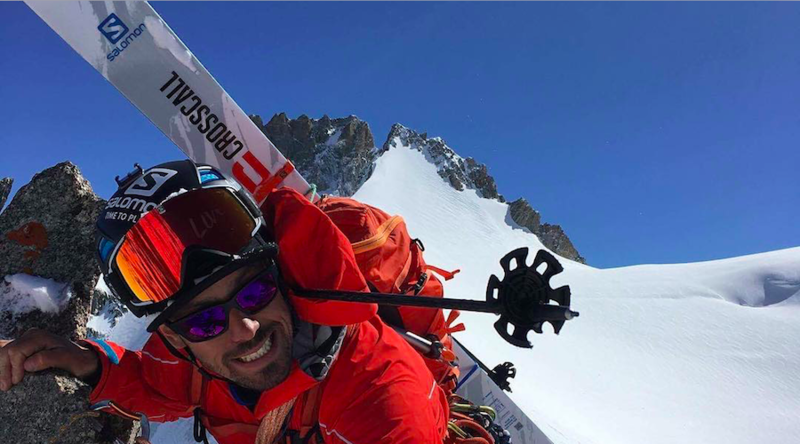 Amer Sports reported sales in the first quarter reached €661.6 million against €635.5 million, a gain of 4 percent. In local currencies, net sales increased by 2 percent. Gross margin eroded to 45.3 percent from 47.4 percent a year ago. The decline was due to less favorable USD hedges compared to early 2016. EBIT excluding items affecting comparability (IAC) was €38.2 million, down from €46.0 million. Items affecting comparability were a loss of €6.7 million against a loss of €6.3 million. Earnings per share excluding IAC was €0.21 versus €0.24. Amer Sports brands include Salomon, Wilson, Atomic, Arc’teryx, Mavic, Suunto and Precor. 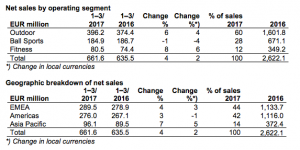 In 2017, Amer Sports’ net sales in local currencies are expected to increase from 2016, despite short-term market softness. EBIT excl. IAC is expected to be approximately at the level of 2016. The growth in 2017 is expected to be biased to the second half of the year. EBIT excl. IAC includes further accelerated investment into the company’s transformation toward omni-channel and digital to win in the fast changing market place. The company will continue to focus on growing the core business and the five prioritized areas: Apparel and Footwear, US, China, Business to Consumer, as well as digitally connected devices and services. “In the first quarter, we delivered solid growth despite the soft retail landscape especially in the US. We continued to successfully accelerate in Apparel, own retail, e-commerce, and China. We made strong progress in Winter Sports Equipment, and started to rebound in Fitness. And we continued to gain market shares in several categories, most notably performance tennis. Whilst we did not deliver target performance in Sports Instruments and Cycling, we continued to strengthen our new product development with exciting initiatives in the pipeline. On Gross Margin, we achieved our target level of 45+ percent. Our higher Gross Margin in early 2016 was impacted by extraordinarily favorable hedges.